• Different tonalities, rhythms, and creative skills. All lines and spaces of the grand staff are used—a few at a time. 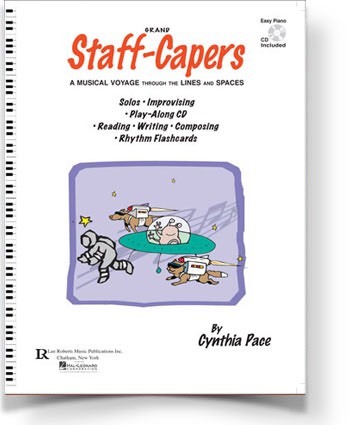 Grand Staff-Capers’ easy tunes provide a lively starting point for many varied and enjoyable learning activities. Together, these songs traverse all lines and spaces of the Grand Staff and introduce 6 different tonalities. Get a feel for each piece by discussing and clapping/singing its words. Patterns presented on rhythm cutouts (included) may be clapped, chanted, played and varied many ways to practice and expand on a piece’s rhythms. 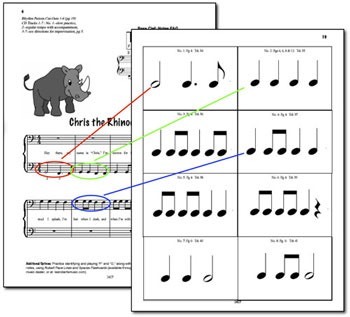 Use flashcards (such as Lines and Spaces, Chromatic Lines and Spaces, and Melodic Shapes) to have students name/play a piece's notes and find its patterns. Have students view the music page, point out notes in random order, and name and play these. 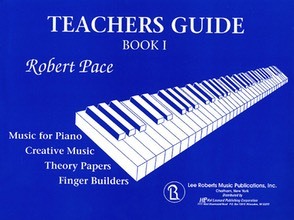 Students may play along with the CD, improvising variations on each piece (directions provided). 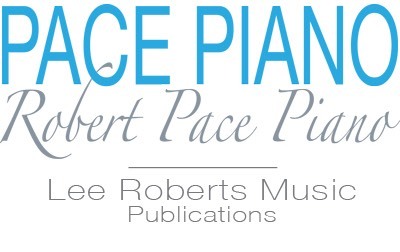 They may also notate new songs they create (pages provided) from given notes or scales. Scales include; Chris, the Rhinoceros (Mixolydian) • Unicorn (Dorian) • Kiai! (Pentatonic) • My Dog (Chromatic) • Sleuth Mouse Detective (Minor) • Song of the Frogs (Major) • A Musical Story (Students' Own). Along with these steps, a wide variety of other teaching techniques and activities may be included.